It was an impressive event indeed. We successfully planted flowering plants, vegetables and fruit trees in the garden site. Planted 30 forest tree seedlings of four species in the memorial planting site (beside main gate). It was a fantastic event; had lots of fun and dancing while planting. We thank all participants from across all faculties, estate office and landscape staff. 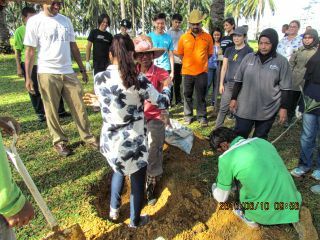 Special thank to staff of Selangor State Forestry Department for their participation and free seedlings. We all now need to take care of these plants. Learn more about UNMC Biosciences activities, achievements, news and events.